Haus of Girls: HAPPY EASTER! 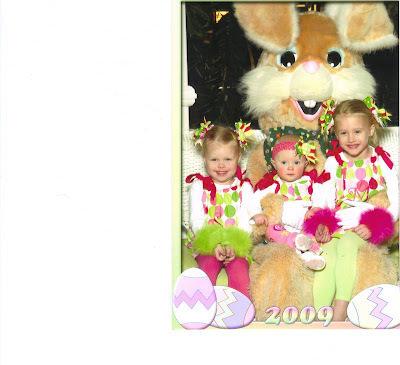 Here are my girls on the Easter Bunny's lap this past week. No Scared Looks on Their Faces. 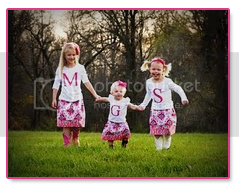 I am happy to have gotten such a cute shot considering the $20 for two 5x7's. With this economy you think they would give us a deal. I always say to myself, "It's once a year. Get a picture." And I am glad because I know I would regret it if I didn't. Easter is one of my favorite holidays. I am so excited to share such a special day with my family tomorrow. I hope everyone takes a few minutes to remember what this day means and how important it is. THey are so stinking cute!!! You did an amazing job on the bows. Love that they didn't hate the bunny either. My girlies hated their bows and were not a fan of the bunny... Oh the drama!!! Happy Easter to your family. I would love to make you a cute blinkie or widget for your blog. I just need your email address to send you the code and need to know if you want it animated (blinkie) or for it to be still (widget). What color or kind of background would you like? If you trust me with free reign, I will design it based on the layout of your site. Shoot me an email: sheinspires@rocketmail.com. Thanks for following me and for the link add!